If you’d like to book me for a talk, please send an email to info@ilsr.org. 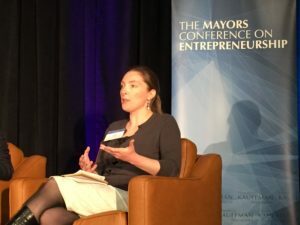 Jan. 26, 2019 — Spoke on a panel about “Building a Strong, Diverse, and Resilient Local Business Community” at the Winter Policy Meeting of the Mayors Innovation Project. Nov. 13, 2018 — Spoke on a panel about “Crafting Effecting Rules for Internet Platforms” at an event hosted by the George Washington’s Institute for Public Policy and the Roosevelt Institute. Oct. 11, 2018 — Spoke on a panel at “A Right to Compete: Are Monopolies Crushing Entrepreneurship?” conference in Washington, D.C., organized by the Open Markets Institute. 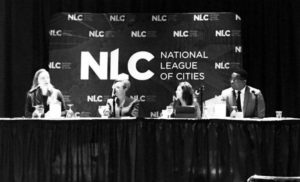 November 18, 2017 — Moderated a session at the National League of Cities conference on “Creating a City Where Small Businesses Thrive,” with Grand Rapids Mayor Rosalynn Bliss, Tory Campbell of Prosper Portland, and Kimber Lanning of Local First Arizona. Read more. August 12, 2017 — Session on the “Economic Impact of Concentration on Rural Communities and Main Streets” at the Food and Agriculture Conference, organized by the Organization for Competitive Markets. November 3, 2016 — Public presentation in Nashville, Tenn., on “Strengthening Independent Businesses and the Local Economy,” sponsored by Indie Nash. October 7, 2015 — Session on “If You Build It, Will They Come?” at the Kauffman Foundation’s Mayors Conference on Entrepreneurship. June 17, 2015 — Speaker at an invitational symposium on “Antitrust and Entrepreneurship” in Washington, D.C., organized by the American Antitrust Institute. October 1, 2014 — Delivered the keynote talk at the annual conference of the Great Lakes Independent Booksellers Association and the Midwest Independent Booksellers Association. April 27, 2014 — Presented a session on “Managing Neighborhood Character through Retail Controls” at the American Planning Association’s National Planning Conference, together with San Francisco Planning Director John Rahaim and San Francisco Planning Commission Vice President Rodney Fong. 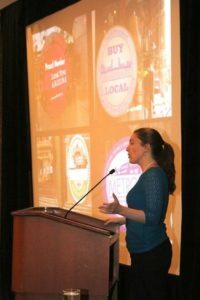 Jan. 18, 2011 — Gave a keynote t alk at the Summit for Advocates for Independent Retail, a Washington, D.C., meeting of leaders of national trade associations and other organizations representing independent businesses. Oct. 17, 2009 — Lecture in Bristol, U.K., at the Bristol Schumacher Conference, organized by the Schumacher Society and the New Economics Foundation. Feb. 2, 2009 — Panel discussion on “Urban Visions: The Neighborhood Store in the Shadow of Urban Redevelopment” at Columbia University’s Graduate School of Architecture, Planning and Preservation, with filmmaker Virginie-Alvine Perrette, Vicki Weiner of the Pratt Center for Community Development, author Phillip Lopate, and architects Tod Williams and Billie Tsien. May 7, 2008 — Keynote at the Third Annual Conference of Good Jobs First.